WOW! Here are some HOT deals on appliances...time to stock up! 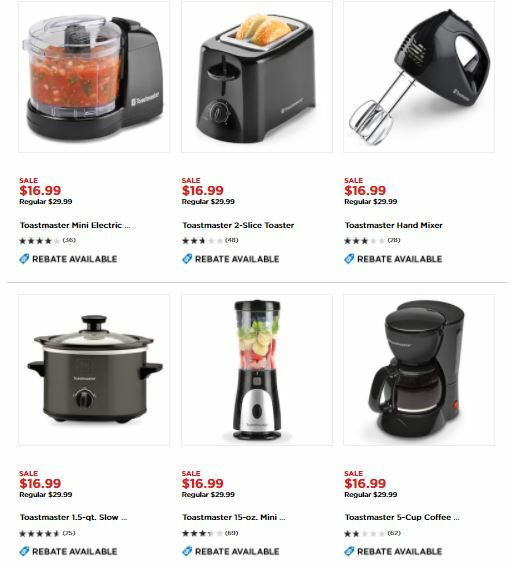 Kohls.com has select Toastmaster Small Kitchen Appliances on sale for $16.99 each (retail $29.99). PLUS, you can submit a $12 Kohl's Visa Prepaid Card Mail-in Rebate when you purchase these small appliances – making them just $4.99 each after rebate! There is a limit of 5 rebates per product and per household. You'll also earn $10 Kohl's Cash for every $50 spent in store, online, at a Kohl's Kiosk or with the Kohl's App on all sale, regular and clearance-priced merchandise! Earned Kohl's Cash will then be redeemable October 2nd – 9th.